The First Indochina War Also Involved: The United States and Great Britain supporting the French side, while the Soviet Union and China supported the rebels with equipment and training. After the Communist victory in China in 1949, the Vietnamese rebels were allowed the use of southern China as a staging point for attacks into northern Vietnam. The First Indochina War Resulted In: Vietnamese Communist victory, division of Vietnam into the Communist North and non-Communist South, independence of Laos and Cambodia. Within three years, the Second Indochina War (The Vietnam War), would begin. The First Indochina War (also known as the French Indochina War), was a major conflict in the Asian region known as Indochina, which is made up of the modern nations of Vietnam, Cambodia, and Laos. The war was fought by France, the long-time colonial ruler in the Indochina, and Vietnamese, Cambodian, and Laotian Communist rebel forces. The First Indochina War ended in French defeat following the surrender of a French army to the Viet Minh rebels in the Battle of Dien Bien Phu in 1954. France began its conquest of Indochina in 1859, and by 1885, controlled most of Vietnam, Cambodia, and Laos. Vietnamese resistance to French rule continued on and off in the decades between the French conquest and the start of World War Two. In 1940, Japan invaded Indochina and defeated the French. A Vietnamese resistance movement fought the Japanese occupation, and after Japan's defeat in 1945, the Vietnamese resisitance hoped to gain independence from the returning French. Following the Japanese surrender in the fall of 1945, British troops occupied Southern Vietnam, while Nationalist Chinese troops disarmed the Japanese in Northern Vietnam. After French forces returned to take control of Indochina, they soon clashed with the Viet Minh resistance forces, and the conflict grew to include all of French Indochina. 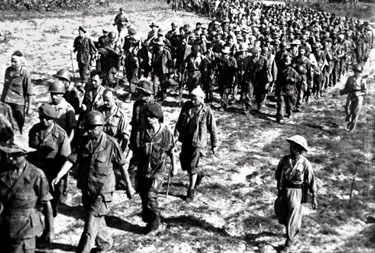 The warfare eventually came to a head in 1954 with the Battle of Dien Bien Phu, in which the Communist Viet Minh defeated the French army and forced the surrender of nearly 12,000 French troops. This defeat led the French to negotiations that resulted in a peace treaty that led to the independence of Cambodia, Laos, and the eventual splitting of Vietnam into two independent states, commonly referred to as South Vietnam and North Vietnam. South Vietnam was allied to the United States, while the Viet Minh became the governing body in North Vietnam and it became a Communist state allied to the Soviet Union and China. A few years after the conclusion of the First Indochina War, the Second Indochina War began as Communist rebels in South Vietnam called the Viet Cong began a campaign that would lead to direct American intervention and what would be called, in America, as the Vietnam War.